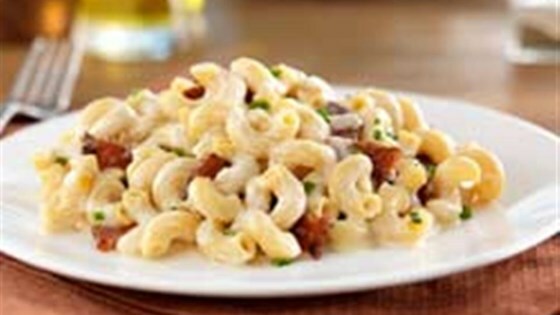 "A fun twist on your family favorite, this delicious gluten free mac & cheese with bacon is a guaranteed crowd-pleaser." Meanwhile saute the garlic in the olive oil for 1-2 minute or until slightly yellow in color. Add the heavy cream and bring to a simmer, season with salt and pepper and reduce by 1/4. Remove the cream from the heat and slowly melt in the Fontina cheese; stir continuously. Drain and toss the pasta with the sauce. Add the Parmigiano cheese, chives and bacon. Toss to combine. Great taste, easy to make, a little oily when reheated. will definately make it again. I doubled the recipe for a large group & used 1 can evaporated milk+ 1/4 cup 1% milk along with the heavy cream. It worked great & helped cut the cost of the cream! Followed the recipe and was very pleased. My gf friends asked for the recipe and suggested it be doubled next time!! This was a very easy meal to make. The taste was very good.